Obituary – Goodwin, Miles Lee « Perry High School Alumni Association, Inc. Newspaper Staff 11; Band 9,10,11,12; Band Council 11,12; Stage Band 10,11,12; Solos and Ensembles 9,10,11,12; Top Ten in Jr. Class. Miles Goodwill, 38, 510 Noble street, died at 7:40 a.m. Monday at his home. No funeral services are planned. Brown Funeral home is in charge of arrangements. 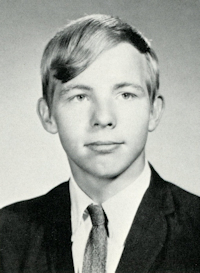 Goodwin was born at Perry, Sept. 14, 1952, the son of Shirley and Mary Goodwin. He was a graduate of Perry high school and Oklahoma State university. He had been employed by Halliburton and CMI. In addition to his parents, of the home, survivors include two sisters, Sally Hopkins and Shirley Marie Valdez, both of Perry; one brother, Wiley Joe Goodwin, Corpus Chrisi, Texas; and several nieces and nephews.